We publish a monthly Prayer Diary with prayer points for every day which is available for download in the sidebar of each page on our website. Each month we begin with praying for news and events, then we move on to pray for two countries and finish with praying for individual prisoners. 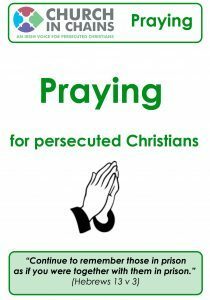 Or you can download our Praying leaflet here, which contains Bible verses and suggestions for praying on your own, with your church or in a home group. It also contains some ideas for leading a prayer group. 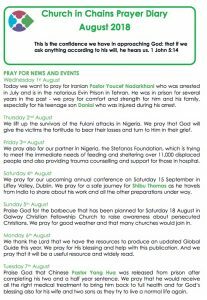 You can also use the prayer points in the quarterly Church in Chains magazine, sign up for weekly Global Update emails, follow us on Facebook or pray through the Church in Chains Global Guide or through the Prisoner Profiles on this website.